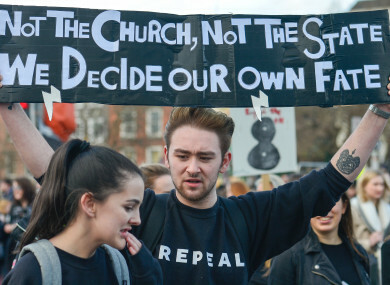 Protesters during a Strike 4 Repeal campaign march held today in Dublin. TAOISEACH LEO VARADKAR has confirmed that the referendum on the Eighth Amendment will be held in May or June next year. The Taoiseach said the “stand alone” referendum would follow on from the recommendations of the all-party Oireachtas committee which is to report by Christmas. Earlier today, one of the committee’s members said that debate on the issue was slow. Fianna Fáil’s Anne Rabbitte said she “would not hold out” that the Christmas deadline would be met. In addition to the referendum on abortion, seven other referendums which have been well flagged have been given a timeline. Specific dates for each referendum are yet to be set. “Any amendment to our Constitution requires careful consideration by the people. They should be given ample time to consider the issues and to take part in well-informed public debate. “Setting a timetable for the referendums to be held over the next two years will allow all involved in campaigning on the issues to plan ahead and to facilitate that public debate,” said the Taoiseach. There are a number of referendums omitted from the list. These include the promised referendums on the establishment of a Unified Patent Court, changes to how the Ceann Comhairle is elected and also a vote on the public ownership of Irish Water. The Taoiseach confirmed that the government has decided to defer making a decision on the timing of a referendum on Ireland’s participation in the Unified Patent Court and said it is “still considering the holding of a referendum on keeping Irish Water in public ownership”. Labour spokesperson on water, Jan O’Sullivan, has expressed her surprise at the failure of the government to advance a referendum to ensure that the country’s water infrastructure remains in public ownership. Labour’s Willie Penrose first proposed such a referendum in his bill published in July 2016. “A key recommendation of the Joint Committee on the Future Funding of Water was that a referendum would be held to ensure our water infrastructure remains in public ownership. “It is bizarre that while considering the possible dates for holding votes on future constitutional amendments that no consideration was given to holding a referendum on water infrastructure,” said O’Sullivan. There is cross party consensus on this issue, and a draft wording has also been discussed at the committee. “It was reported just a week ago that the Attorney General’s office was examining this issue. The Water Services Bill has been published but we have yet to hear when the Government plans to hold this vote,” she added. A government spokesperson said there is still an intention to hold a referendum on water ownership, adding that it may well make an appearance in the timeframe given. The referendums due to be held in October 2018 will coincide with the presidential election, if one is held, said Varadkar. It is proposed that the June 2019 referendums could be held on the same day as the local and European elections. Varadkar said the government decided against the previous idea floated of holding a “referendum day” stating that it was thought having so many questions on one day would be confusing. During Taoiseach’s questions, a number of TDs asked Varadkar about the date in which Pope Francis is due to visit Ireland. Labour’s Joan Burton argued that a significant time gap should be given between the visit and the referendum on the Eighth Amendment. Varadkar said he met with religious leaders recently, adding that no date has been set for the visit of the Pope. However, he pointed out the World Meeting of Families is to be held in Ireland from 21-26 August 2018. He said if there are any suggestions for another date for the referendum of the Eighth Amendment, he would be interested to hear it. He said he would like to hear why such a date might work better. However, he said the earliest date the referendum could be held is in May and June. Whether the Taoiseach campaigns for each referendum will be made on a “case-by-case” basis, according to a government spokesperson. Email “You'll be asked to vote in quite a few referendums over the next two years”. Feedback on “You'll be asked to vote in quite a few referendums over the next two years”.